completing ⋆ 100% Private Proxies - Fast, Anonymous, Quality, Unlimited USA Private Proxy! My family flew in Kiev-Paris-Dublin to visit us in Ireland, end-to-end return flights booked with AF-KLM. Unfortunately, they were stopped at the boarding for the Paris to Dublin flight, due to an Irish visa issue that wasn’t spotted by anyone until that point of time. The AF agent in the airport suggested they speak to an Irish embassy and try to rectify the visa. The visa was fixed and they are in Dublin now, but the KLM customer service says that they will need to pay a large (circa 250 EUR) penalty fee to be allowed to fly back on their return tickets, since they didn’t use their journey to Dublin, and that they can only complete a (possible!) check-in for flight in the airport itself. Is that sort of penalty legal and what can we potentially do to avoid the fee/make sure they can fly tomorrow? As attachments to a post, the green bar fills up all the way, it looks like the photos have attached, but when I then send the post, it sends without the attached images. Tried on both Chrome and Firefox. It seems like I might not be alone in this problem, but that long thread seems to contain no answers or solutions, only complaints. Currently my very crude workaround is to upload the images to an Imgur page, and post a link to that in my (empty) “photo album” description, but that’s a bad workaround. What can cause this and how can I post photos so they actually show up? I’ve found one possible clue: almost all photo albums created since December 2015 are strangely empty like mine, as if people posted the photos then didn’t realise it hadn’t actually worked. Some people do successfully post photos, but it looks like it has failed for the vast majority of people since December 2015. I can’t see any obvious difference with the few it succeeds for. I have a list with an Out-Of-The-Box (OOTB) workflow. It’s a SharePoint 2010 workflow on the SP2013 platform. If I am using a normal user machine, I load the site, and I create a list item, the workflow fails to start. I cannot find anything useful in the SharePoint logs. We’re currently requesting for Event Viewer and IIS logs. 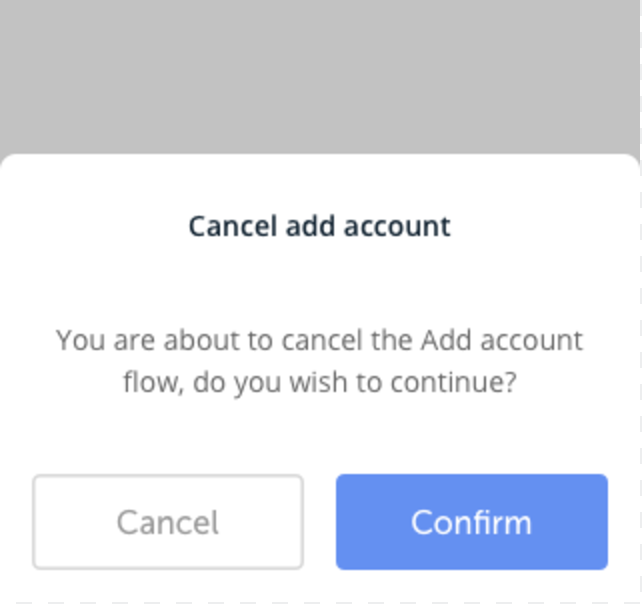 I am working on a mobile app and the flow is mainly to add one or n accounts. The flow has 3 steps and you can’t jump to the next step if you haven’t filled the previous one. When designing the flow I found that if I press the cross button by mistake i loose everything, so I added a confirmation modal to not loose our users. What do you think? is it something very common on mobile?